Israeli warplanes attack terror targets belonging to both Hamas and the Islamic Jihad. Schools in Gaza envelope will be closed on Tuesday. IDF fighter jets on Tuesday morning attacked additional terrorist targets in a military compound belonging to the Hamas terrorist organization in Dir al-Balah in the central Gaza Strip, the IDF Spokesperson's Unit said. In addition, several military targets belonging to the Hamas terrorist organization were attacked by tanks and helicopters. Overnight Monday, the IDF updated that Israeli warplanes had attacked some 15 terror targets in the northern Gaza. The attacks were in retaliation for the rocket fire at Israeli territory. "The Hamas terrorist organization is responsible for all the goings on in and out of the Gaza Strip. The IDF is determined to carry out the task of protecting the citizens of Israel and is prepared for various scenarios and intensifying its operations as necessary," the IDF Spokesperson’s Unit said. 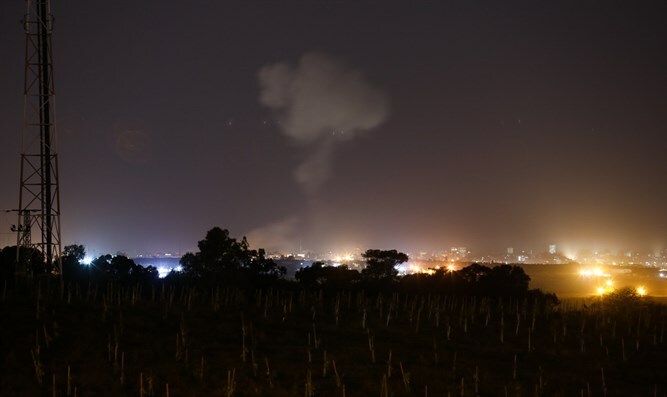 The IDF Spokesperson's Unit said that from 10:00 p.m. until 2:45 a.m., about 30 launches were identified from the Gaza Strip towards the communities in the area. On Tuesday morning, the Home Front Command published updated guidelines for residents of the Gaza envelope. According to the guidelines, it is permitted to hold gatherings in a closed area only, with up to 300 participants. In addition, classes in the Gaza envelope, Ashkelon, Ofakim, Netivot and the regional councils of Bnei Shimon, Merhavim and Hof Ashkelon will be cancelled on Tuesday.